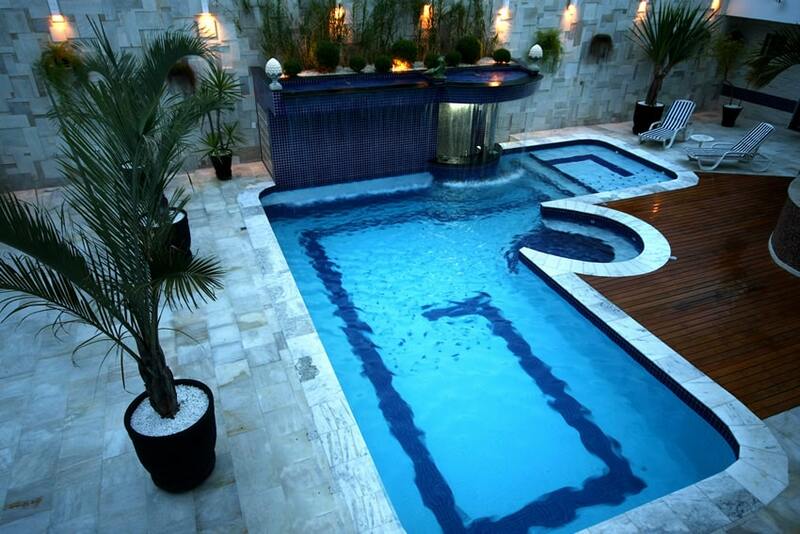 Welcome to our gallery of swimming pool water features. These pictures feature a variety of water features designed specifically for pools to enhance their beauty. There are a wide variety of water features available. Some of the most popular types of water features are waterfalls, fountains, cascades, sheetfalls, water walls and spillways. In the picture above is a contemporary sheetfall water feature using stainless steel spouts attached to concrete walls gives a simple yet elegant effect to this modern pool area. A long wood deck frames the pool and continues to the spa with its impressive hillside view. 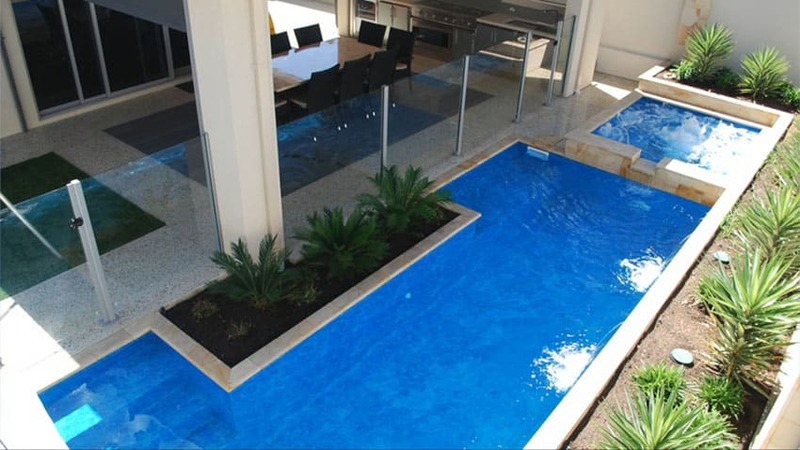 Swimming pools can greatly enhance the atmosphere of one’s home. Aside from primarily providing fun and recreation for family members, swimming pools also increase the aesthetic appeal of your home and at the same time, boost its value. Since it is considered to be a large part of the yard and a main attraction for most houses, enhancing its beauty should also be given attention to. If you want to elevate the overall interest of your swimming pool and transform it into a stunning work of art, adding a water feature is one of the solutions you can take. Water features are an integral part of swimming pool design because it can instantly transform an existing pool into a more attractive part of your property. It adds the “wow factor” to a swimming pool – whether it may be used to create a striking focal point or create a cozy ambiance. A water feature can also give a different character to your swimming pool, from a refreshing oasis, to a serene retreat, a tropical resort, a romantic escape or a kid friendly zone. With the primary purpose of beautifying a poolscape, aesthetics play a big part in choosing the right water feature for your swimming pool. 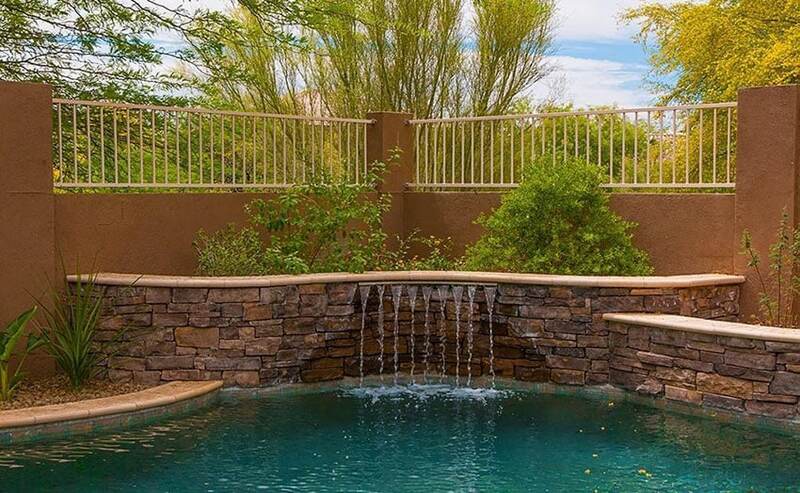 Whether it may be a simple water feature or a towering six foot tall waterfall that has a grotto, a stunning water feature improves the look of your backyard and gives your guests a sight to enjoy. However, aesthetics and visual impact aren’t the only factors that you have to consider to create a water feature that will leave you and your guests in awe. 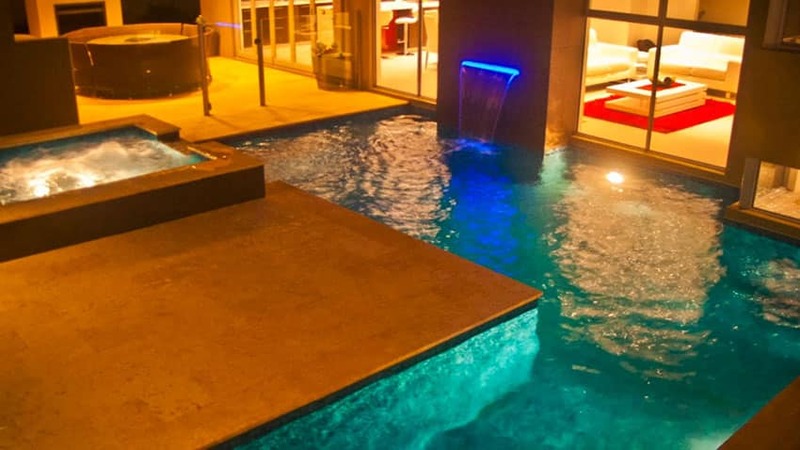 Sound – Most homeowners opt for an added water pool feature for their home not only because of the visual aesthetics but also because of the sound it produces. It is equally significant to establish the mood that your water feature will create. A well designed pool water feature must not only be visually appealing but is equally enticing to other senses. Ambient noises like the sound of flowing water is said to produce a relaxing vibe and a calm atmosphere. WHile if opting for a quiet environment, go for water features which do not produce sound. Flow of the water – Dynamics is also a significant part of swimming pool water feature design. The flow of water, including its direction and how it enters the pool can cause corresponding effects to the overall look of the water feature. Fluidity in motion is one the factors which makes swimming pool water features visually satisfying. While some may opt to go with dynamic water features, others may choose to go with the stillness of water. Some water features produce a stunning mirror like surface that emanates tranquility. Effects – Water features often include features that can be adjusted to different settings, providing different effects. These features can be activated depending on the current mood of the user or the personal preference of the homeowner. Lighting – Mood and accent lighting can be added to the water feature to enhance its ambiance and appearance. Warm lights or colored lights add visual interest and also make your water feature stand out especially at night. Natural lighting is also another important factor as the way the water feature reflects and refracts sunlight causes an effect on the color. 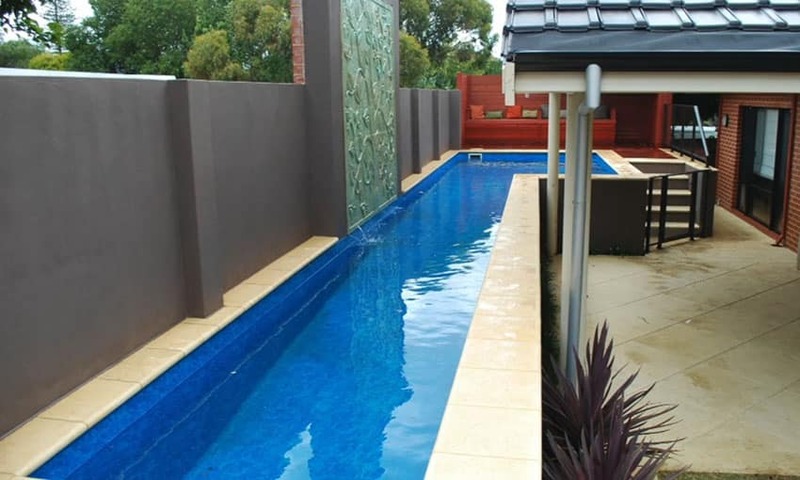 Budget – Budget also plays an important part in choosing the right water feature for your swimming pool. Some may consider it to be the biggest constraint because it dictates the features which you can include to your water feature. You can know more about swimming pool water features as you read on our article. This massive Mediterranean style pool area gives it a touch of contemporary element by adding a cascading water feature which falls high from balcony/ceiling area. The twin sheetfalls gives it a high waterfalls effect, creating a curtain of water. Swimming pool water features are available in different styles, type and materials. 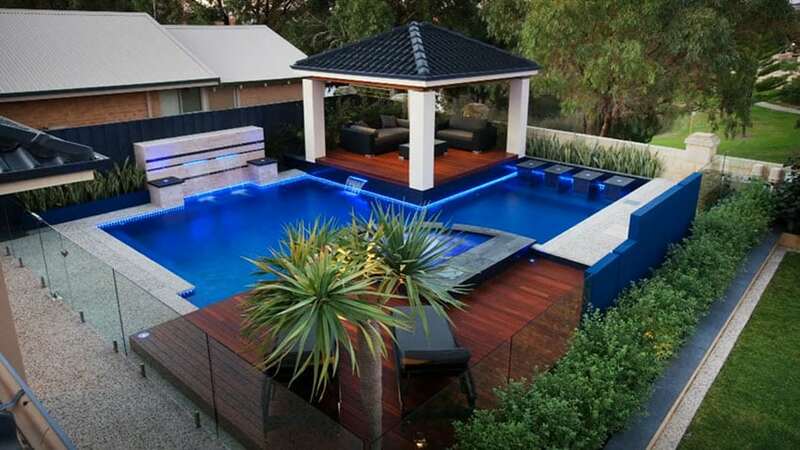 Each type produces a different effect to the ambiance of your swimming pool. 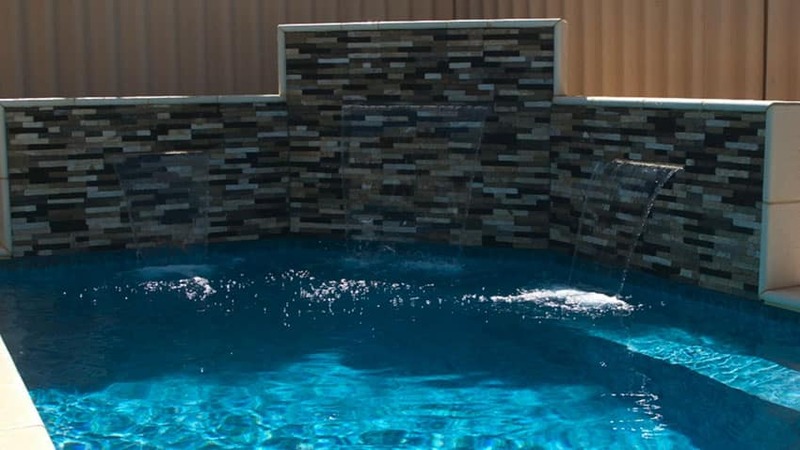 With the endless options to choose from, the task of selecting the right water feature for your swimming pool may be a bit confusing. To help you decide which one is the best for you, here is a key guideline which you can follow to eliminate the guesswork. The first thing that you have to consider in choosing the right water feature is the existing style of the swimming pool. As in any case of home design, determining the style is integral because this will dictate all the other design elements of your area -from the smallest of the details to the most dominant component. If your swimming pool is more on the rustic side, opt for a natural looking water feature like a rock waterfall. For a modern or contemporary inspired swimming pool designs like a lagoon pool, streamlined sheet falls and laminar jets complement a formal and minimalist look. Mediterranean inspired swimming pools can be enhanced with sconces that are ornamented with motif likes lion heads. Aside from the prevailing style of the swimming pool, the surrounding environment should also be taken into consideration. The water feature must blend with the topography of the property. Take advantage of high elevations, especially if your house is situated in a tall hill. Create water features with varying steps and allow water to fall with a “step ripple effect” or water that spills over several layers. 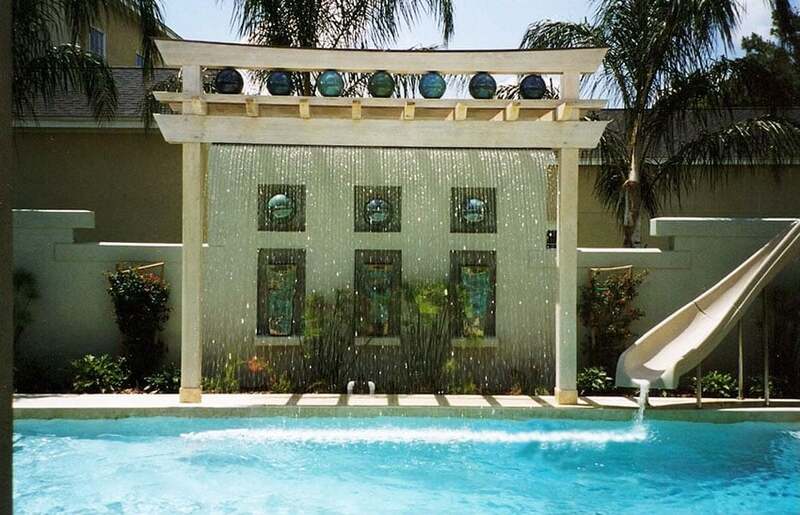 This rainfall curtain feature was placed on a Japanese-inspired wooden arc or torii, adding a soft and natural effect to the pool,and complementing the overall design of the surrounding space. 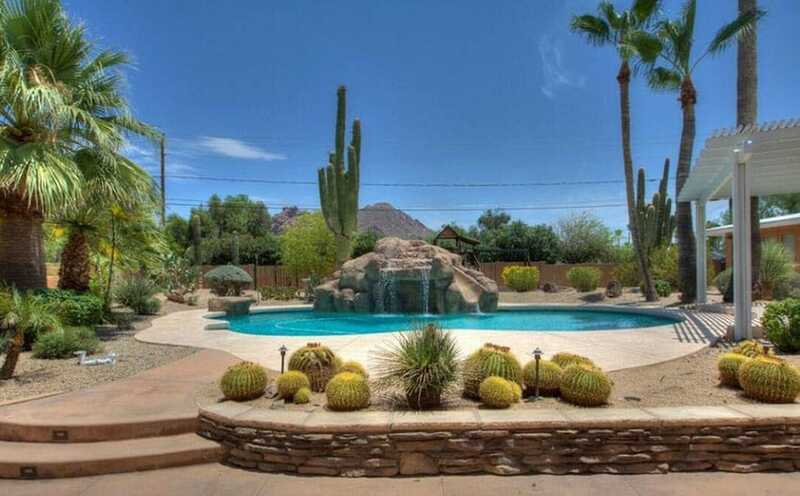 On the average, water features takes up about 10 to 15 percent of the total cost of pool construction. Naturally, water features which are more elaborate cost more because they require more material to finish and an additional water pump. An additional water pump, especially if it’s large, consequently increases utility costs of running your swimming pool to a minimum of five percent or $30 to $40. Generally, waterfalls are the most expensive because they require a separate pump and are more elaborate in terms of design, thus incurring more labor costs and material expenses. 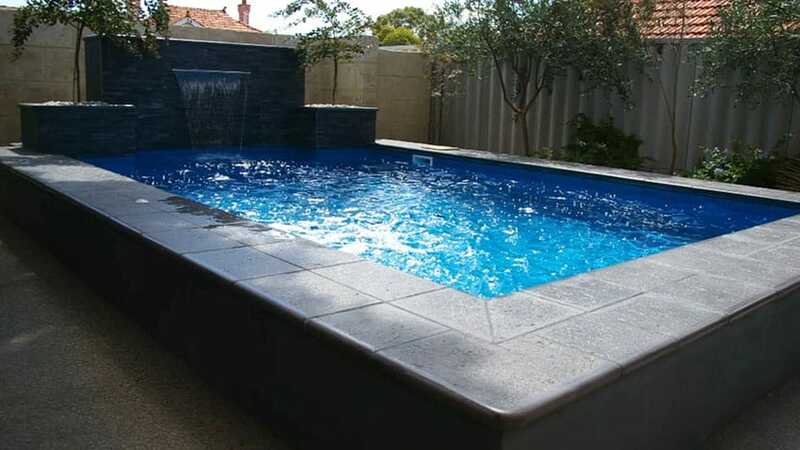 On the other hand, small water features such as scones or scuppers are considered to be the most affordable because they can run on the primary pool pump. They also incur low operating costs. Operating costs for swimming pool water features are typically $10 per day, if run for 8 hours on a small pump. Additional design elements such as ambient lighting also cause material costs to increase. Labor costs are also added because they require installation services from professionals and specialists. Typically, underwater incandescent lights costs $300 per piece, LED lighting costs $700 to $1000 per feature, while spotlights can amount to approximately $500. 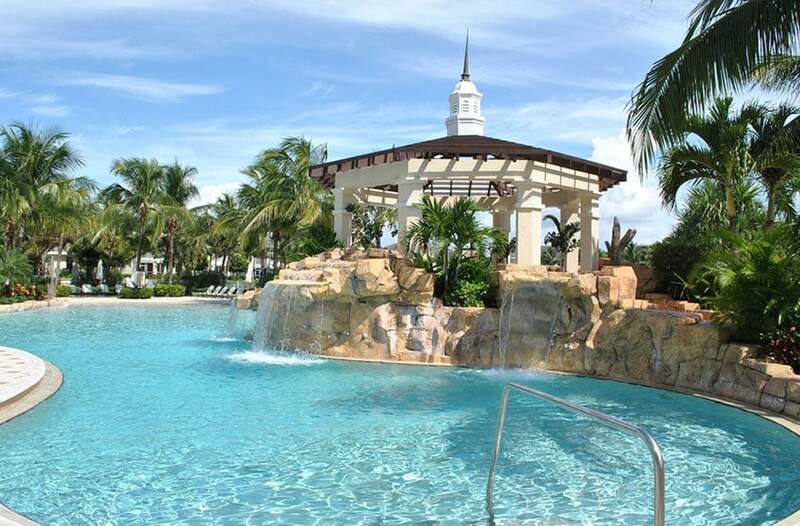 Waterfalls or rock waterfalls – This type of water feature is commonly used for lagoon style or tropical themed swimming pools. Its design varies depending on the homeowners taste and can range from simple rock structures to more complex ones. 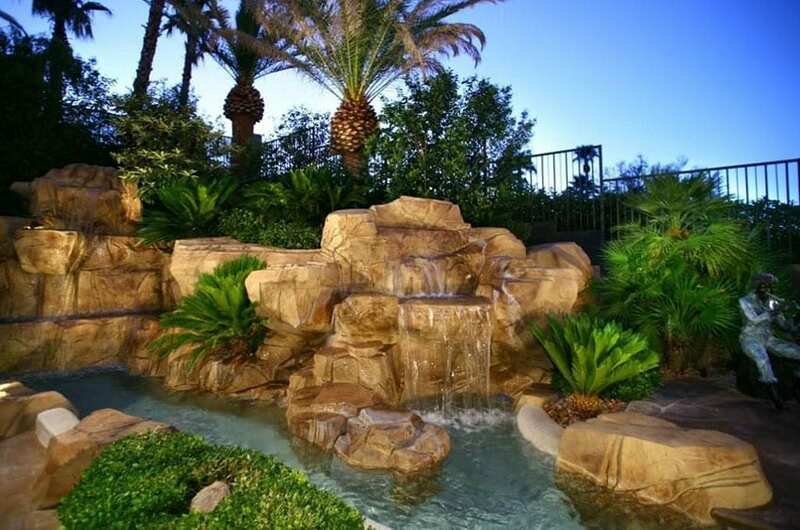 Rock waterfalls are constructed to look like natural rock formations, custom rock waterfalls can be expensive to install and usually run off of their own pump system separate from your pool’s system. Sheer waterfalls – This is appropriate if you want to achieve the waterfall effect but go with a more modern vibe. 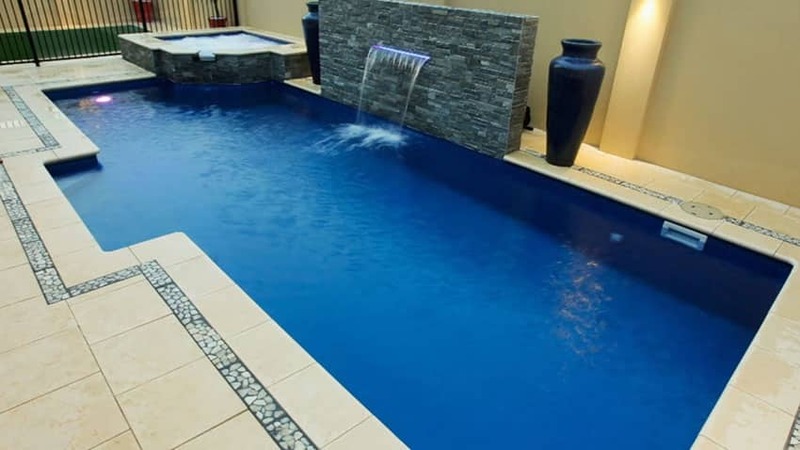 Compared to the rock waterfall, this has a more subdued and simpler design that is perfect for contemporary and minimalist pool designs. Fountains – Fountains are very elegant and can make any pool look luxurious. This water feature design can vary from the simple to complex. Simple fountains may be small openings found at the edge of our pool, splashing water. While the complex ones can use more elaborate design motifs that are incorporated into the poolscape. 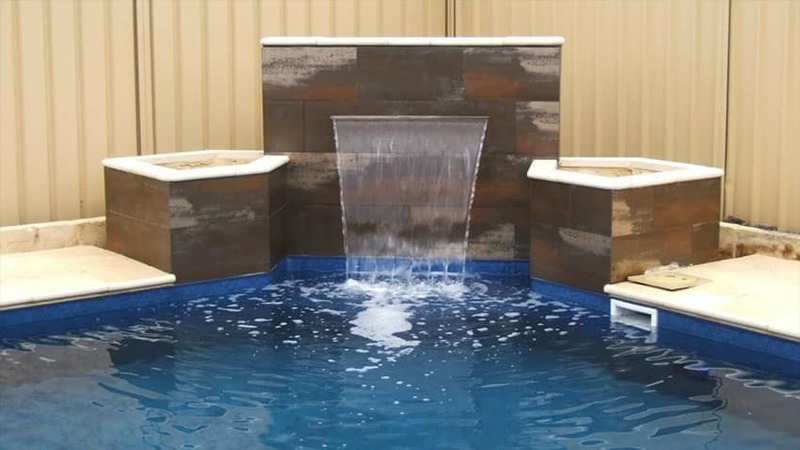 Spillover Spas – This type of water feature is used for connecting your main swimming pool to a hot tub through the use of spill overs. 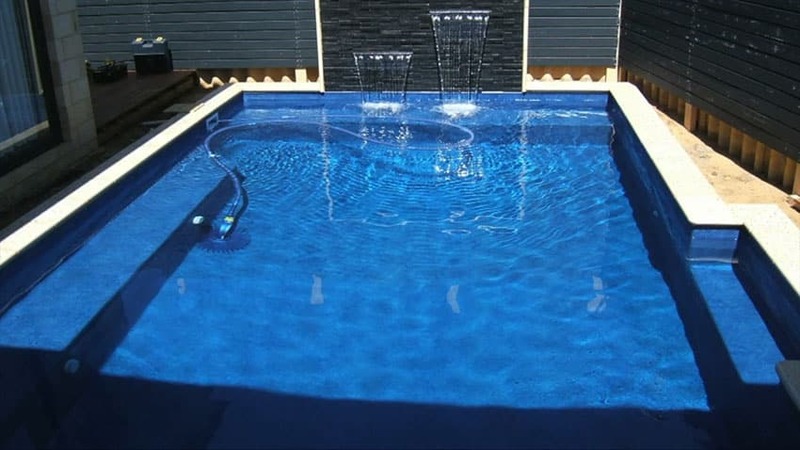 This is highly suitable if your swimming pool is at a raised level than your hot tub, because you can create an effect where the water is transferred gracefully from one area to another. Sconces – Sconces are inexpensive types of water features which are mounted to swimming pool walls. This feature is decorative and has a small opening where a narrow stream of water flows. Jets and Bubblers– Fountain bubbler, foam jet and sun jet are some of the most common types of jets and bubblers. Resembling a “mini geyser”, this feature shoots up water off the pool floor. You’ve probably seen one of these types of water features in the shallow end of a pool. They generally shoot a thin spray of water directly up in the air. They come in a wide range of models and can run from inexpensive on up to pricey custom jobs. Deck Jet , Fountain Spitter and Sheetfalls – This feature shoots a narrow stream of water from the deck into the pool. This is considered to be one of the most inexpensive options for swimming pool water features. Going for a more contemporary approach, sheetfalls flow in an arc of water in to the pool. They are usually easy to operate when run off your pools pump system. Laminar Jet – The laminar jet produces an illusion of a glass tube by producing a steady and forceful arc of bubble free water. This is typically more expensive than a deck jet. 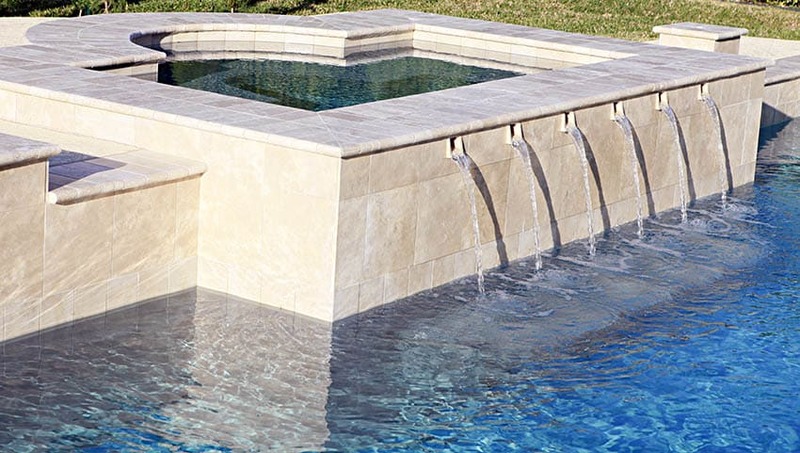 Scupper – Scuppers are another type of small water feature that is characterized by small opening or slots which channel water back to the pool. Usually made up of a small ledge which allows water to fall down to the pool. Popular in hot tubs a scupper can be as simple as a hole that allows water to flow in to the pool and recirculates back around. Scuppers are a great choice for those who want an easy to maintain water feature that will provide the soothing sound of flowing water. Rainfall Curtain – A rainfall curtain, as the name suggests, creates a curtain of water. A series of pencil like streams of waters run down from an elevated beam, thus creating the curtain like effect. The water from rain curtains falls straight down creating a tropical lagoon effect that is eye catching and appealing. Waterwall – A waterwall feature has water cascading from above, down to the walls. Pool Fire Bowl – Not really a water feature, but more of a pool design enhancement, a fire bowl is similar to a fire pit that creates a wonderful night time ambiance. Pool fire bowls can create a warm alluring glow that helps give your backyard a resort atmosphere. When paired with waterfalls the night views can be dramatic. Wonderfall – This simple water feature contributes an exciting experience to the users through its spraying feature. Basically, it is made up of a piece of plumbing that connects to the pool’s return, creating a spritz of water. This is popular for kid friendly pools and is often used to cool off. Rather than go with the traditional water scupper found in many hot tubs this design opts for creative water fountains to recirculate water back in to the pool. 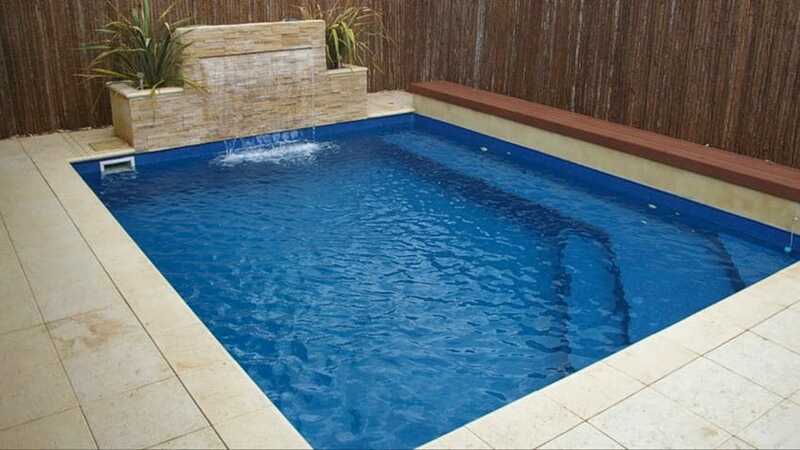 Lagoon style pools with a rock waterfall feature are designed to enhance its look and give it a more natural feel. Topped with a water fountain and slide this custom water feature really reinforces the look of a tropical oasis. 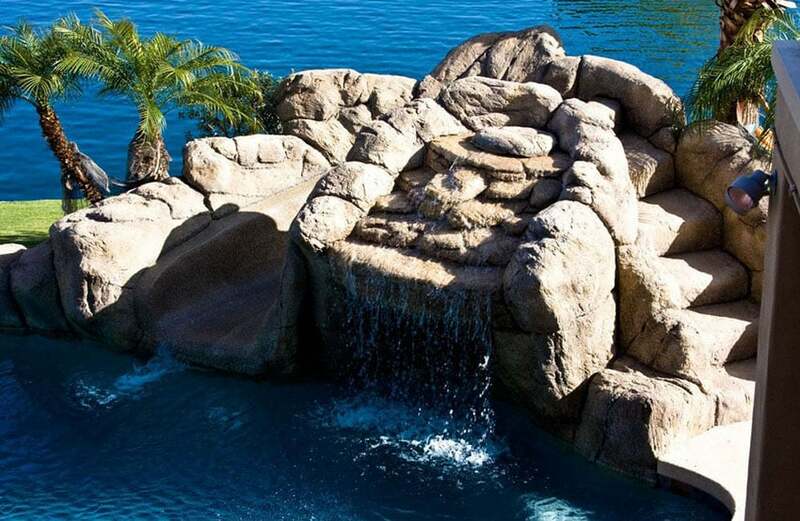 A lagoon style pool which uses rock waterfalls as added feature, but this one uses lower and a more random arrangement, giving it a more natural feel. This tropical style pool uses rock waterfall feature, created using large orange-toned sandstone boulders to give it a natural look. 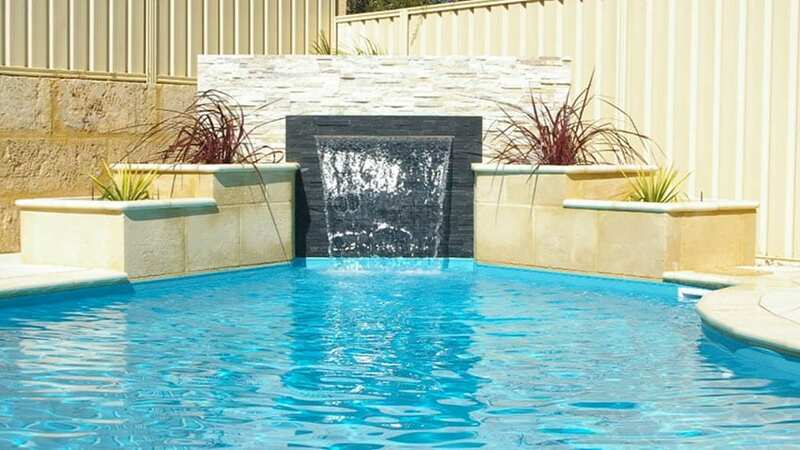 Swimming pool water features that have rock waterfalls are a great place for bathers to stand or swim and let the water cascade over them, creating a relaxing environment. 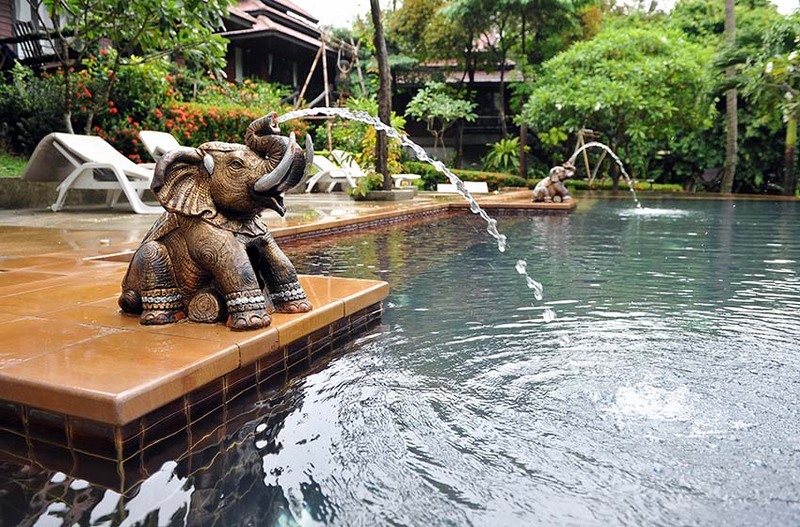 Decorative elephants make an attractive fountain water feature that creates a playful environment. Despite the modern design of the pool itself, the water feature used is a rock waterfall, giving it a natural-looking element. The rock waterfall also functions as a pool slide, making the addition functional and aesthetically pleasing. This is a different angle of the pool from above. Here you can see the concrete walkway, large wood pergola and surrounding landscaping with cacti and desert environment. A pool sheetfall can definitely add an exotic element to your design. Not only does the water flow create a soothing sound it is a favorite place to relax for kids and adults alike. This rock waterfall feature lacks the natural look of the previous examples, as it goes for a more architectural look, using stone cladding on concrete. 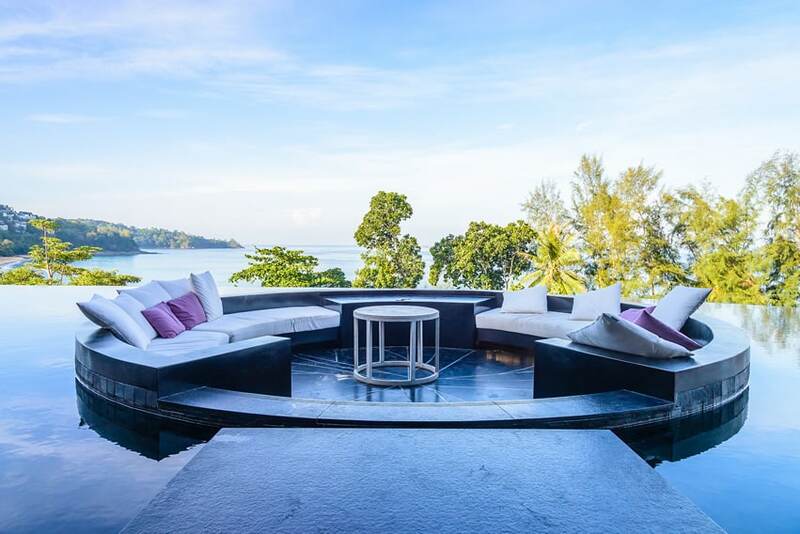 This luxury infinity pool with seating area makes a big impression and is an ideal way to enjoy a cocktail and conversation. Not only does the outdoor living area have comfortable couches, it offers sweeping views of the ocean from its hillside locations. Another very simple water feature, using a small sheetfall feature placed right below the plant box at the side of the pool area. The very small size of the pool limits what you are able to place in the space, and therefore, a minimalist water feature was used. A sheetfall was used to add a wide, thin stream of water flowing from the plant box at the end of the pool. Another sheetfall water feature placed on a plant box with wood effect tiles at the corner of the pool area. Due to the limited space, this contemporary Mediterranean-inspired pool uses a simple deck jet water feature. The large rectangular part of the pool is ideal for swimming laps while the other side is perfect for soaking. 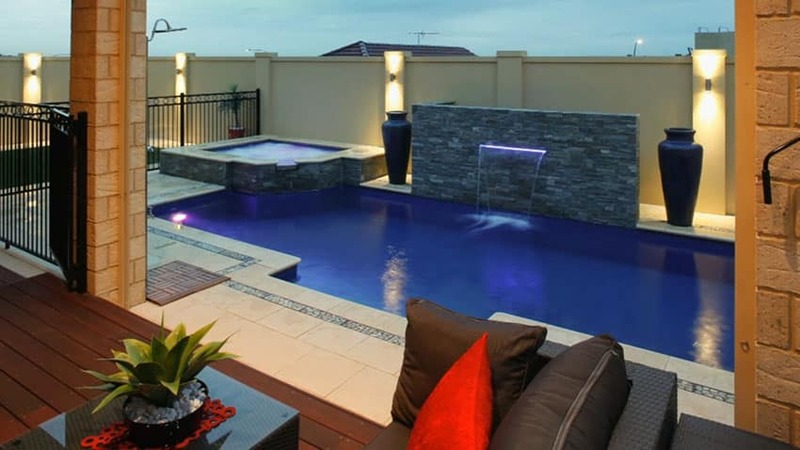 This modern pool design combines scupper water feature which allows the water from the Jacuzzi to flow down the main pool and a couple of sheetfalls placed on plant box side of the pool. 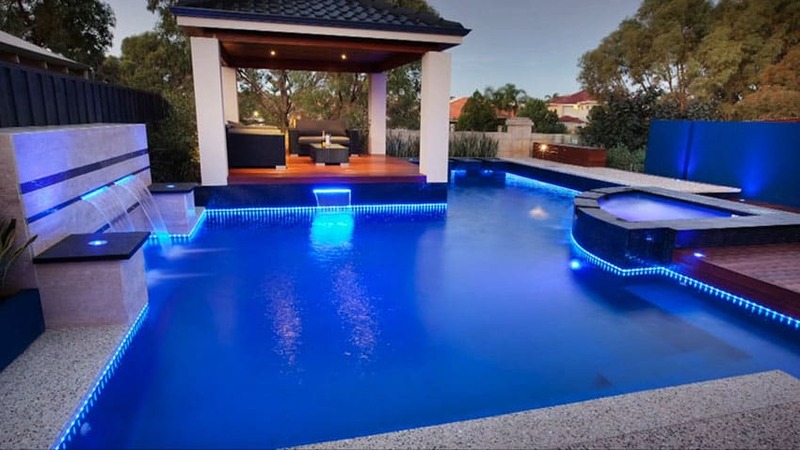 Another modern pool which uses a blue LED-illuminated acrylic sheetfall water feature, which sends water flowing from the column. An elevated spa with spillway creates another place where water can cascade in to the pool for added effect. This LED-illuminated acrylic sheetfall water feature was placed around certain elevated areas around the pool, giving the water flowing down a stunning glowing effect. An elevated hot tub overlooking the pool allows bathers to enjoy the well designed scenery. From this angle of the pool one can see the elevated wood deck with its lounge chairs and tropical plants. Another wood deck with gazebo sits in the opposite corner with stylish dark color modern furniture. Sheetfall water feature helps add a simple yet elegant element to your pool design. This example uses three water curtains at the corner area of the small pool. This is another sheetfall water feature which sends water sprouting from a built-up low wall clad in faux slate at the side of the pool area. 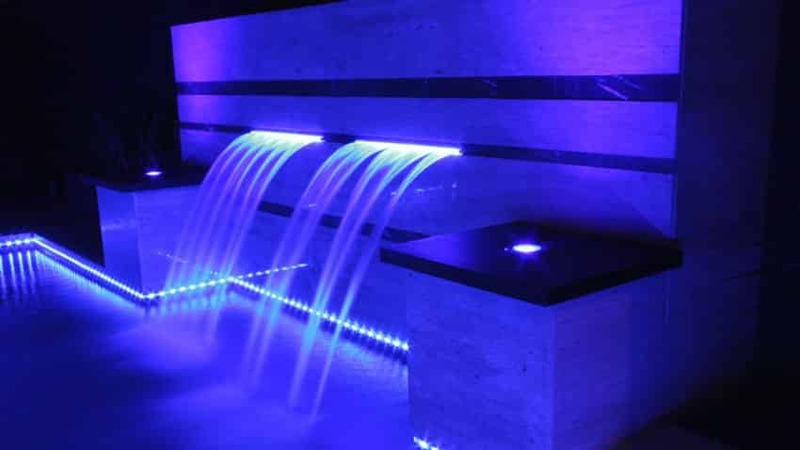 The LED lights in this sheefall water feature gives a bold and futuristic effect to this modern pool area. Limited space means only a small and simple water feature can be added. This example uses 2 sheefall features on a built-up wall placed against the fence. A cascading curtain water feature placed at the end of the pool area where there is a built-up plant box clad with faux black slate, giving it a modern appeal. 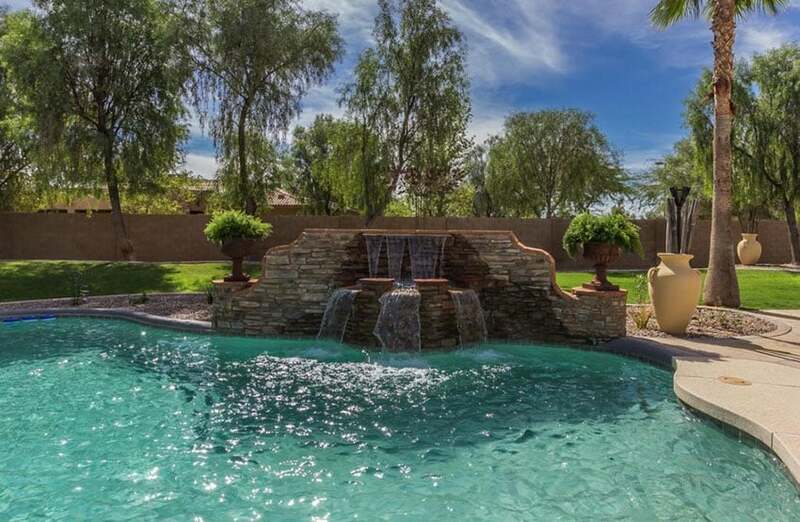 This luxurious swimming pool with mosaic tile spillway provides a dramatic flow of water from above. 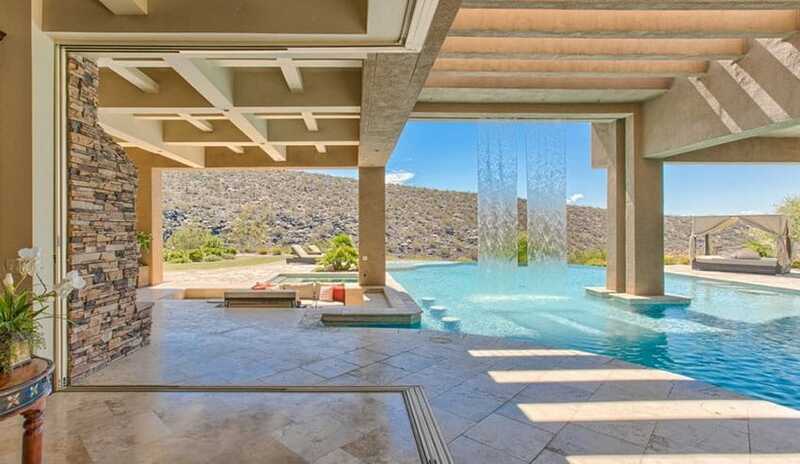 The cascading curtain of water creates an alluring backdrop that heightens the ambiance of the pool area. With its gorgeous pool, wood deck surround, tropical potted plants and illuminated stone wall this is an ideal backyard retreat. 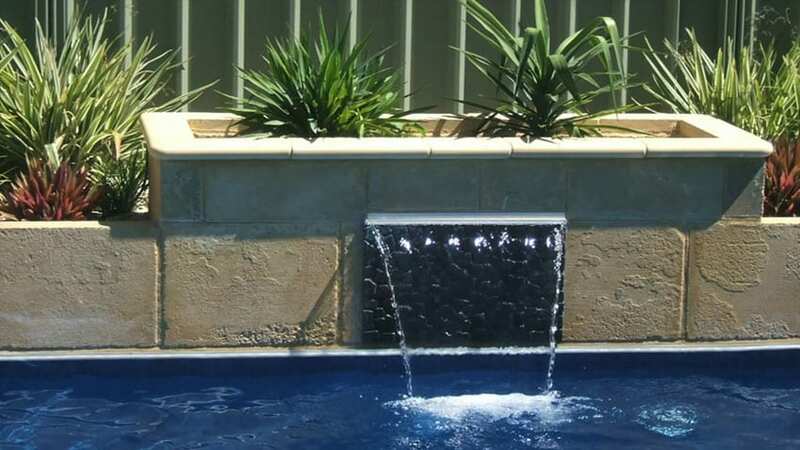 This small waterwall water feature adds a simple yet elegant element in this modern Mediterranean pool. The dark stacked stone of this water feature against the lighter stone adds contrast and depth to the space. What’s unique about this waterwall feature is that right above the flowing water, is a very large relief sculpture which helps add emphasis to the pool area. Another modern sheetfall water feature placed on a built-up ledge, and lit with LED to give it a glowing effect at night. Outdoor furniture with comfortable cushions beacons visitors to enjoy this inviting pool area. This modern pool area uses 2 sheetfall features placed on the side plant boxes and scupper which directs overflow of Jacuzzi to the main pool. 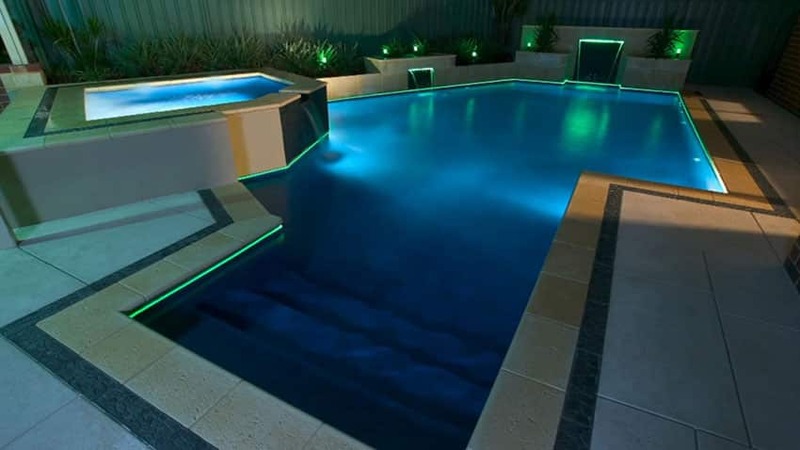 Dramatic neon lighting adds a resort like feel and enhances the feel of night time swimming. Another rock waterfall feature, but instead of using constantly flowing water from the elevated area, this one relies on the flow or movement of the water from the raised jacuzzi/pool area. The river stones clad around this elevated area help give a more natural-looking water flow. This massive modern pool adapts a rock water fall feature to match its Mediterranean style gazebo, using large blocks of limestone. This can also pass as a scupper water feature, as it uses the limestone blocks as ledge in which the water flows down. Swimming pool water features that incorporate natural looking stone give the illusion that one is swimming in a natural pond. 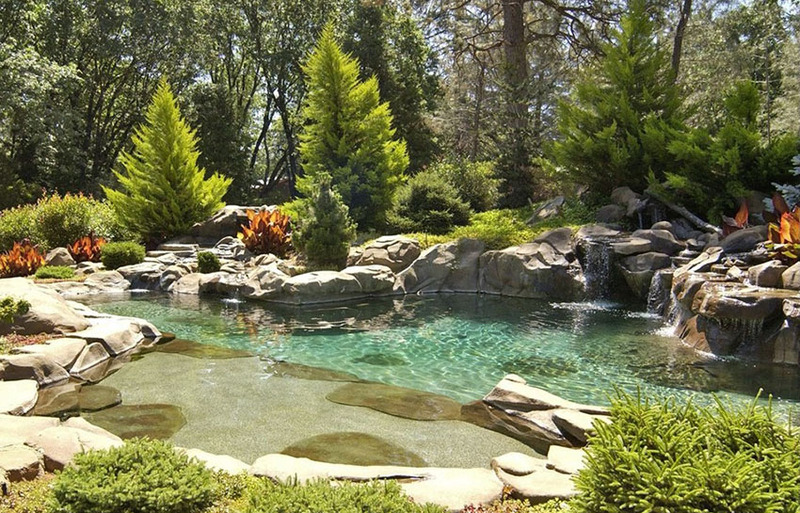 The soft flow of the rock waterfalls adds a very ethereal over-all effect in this lagoon style pool. This pool has a very simple waterwall feature, placed on the plant box at the corner of the pool area. 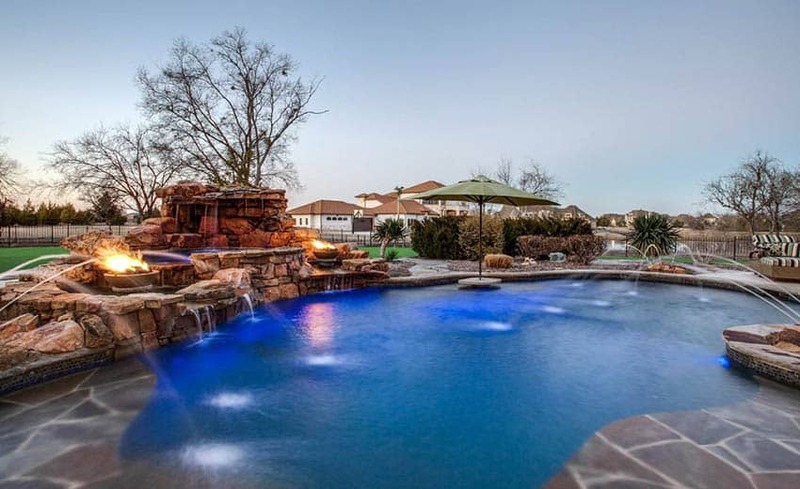 This swimming pool features two dramatic fire bowl water features on both sides of the rock hot tub to create an amazing night time ambiance. 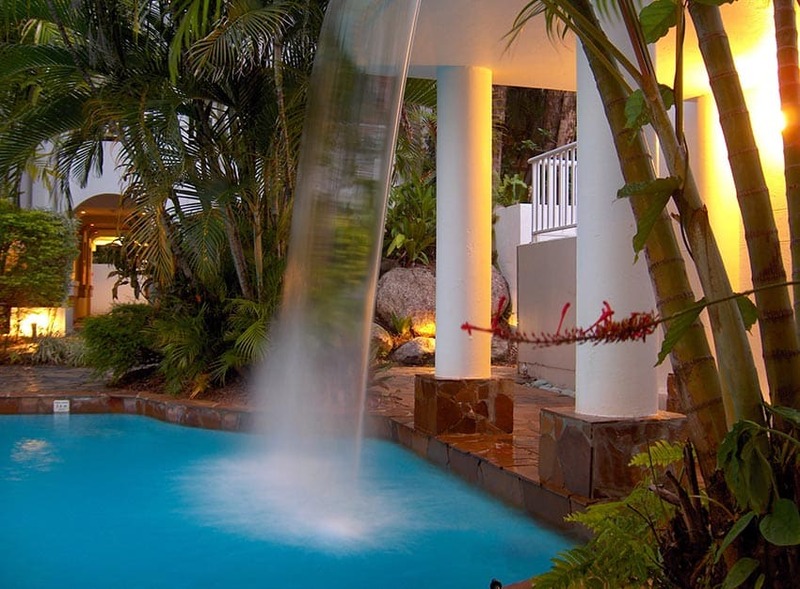 Water jets and numerous waterfalls offer plenty of luxury elements to this creative pool design. 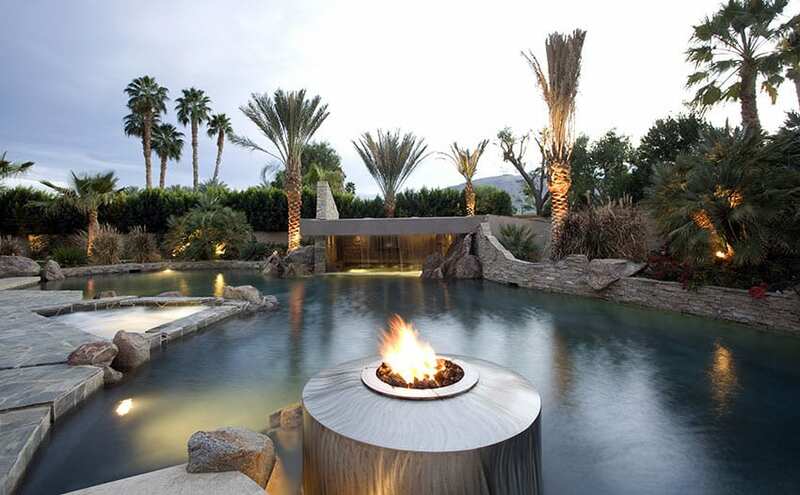 This lagoon style swimming pool showcases a modern fire bowl peninsula. A fire bowl water feature can be a great draw for swimming or socializing around the pool at night.